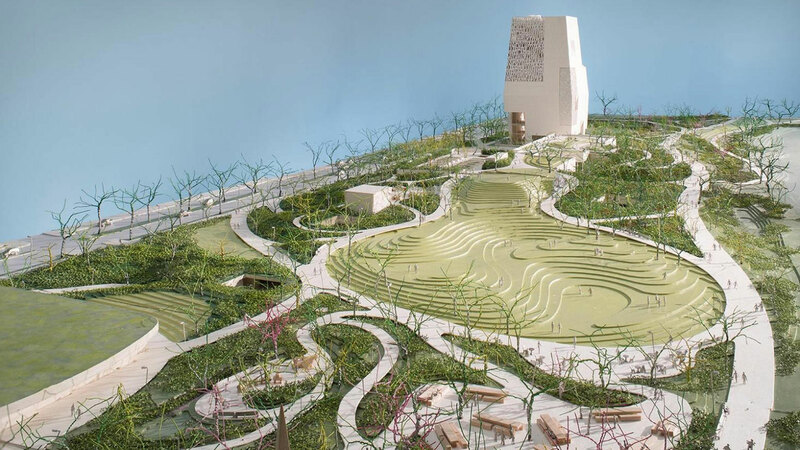 Following the decision yesterday to bury the Obama Presidential Center’s controversial parking garage under the center itself, the Obama Foundation has announced major changes to the rest of the campus. 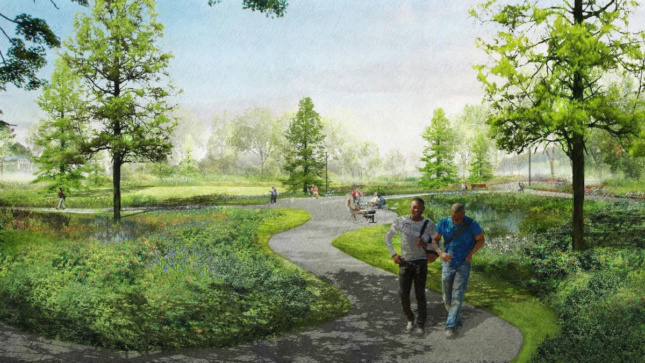 The complex, which will eat up approximately 20 acres of the Olmstead and Vaux-designed Jackson Park on Chicago’s South Side, has faced scrutiny from preservationists and residents throughout the design process. 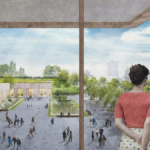 When it was first unveiled, the Tod Williams Billie Tsien Architects | Partners and Interactive Design Architects plan called for a squat, stone-clad museum at the heart of the center’s campus. 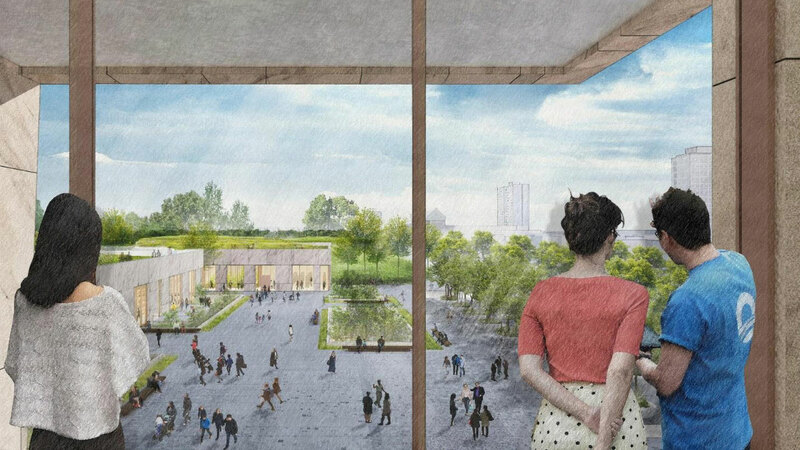 The museum is joined by a forum and library with the three buildings ringing a central plaza, while each is connected to the other via perforated underground tunnels that let in natural light. 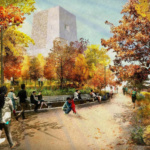 Coming a day after the announcement that the parking garage was moving from the Midway Plaisance and into the park itself, the latest design for the center was revealed in a video from the Obama Foundation. In it, the former president and first lady present a new conceptual model of the site and discuss the changes therein. Most noticeably, the museum will now be slimmer but top out at 225 feet, as opposed to the originally planned 160 to 180 foot height. 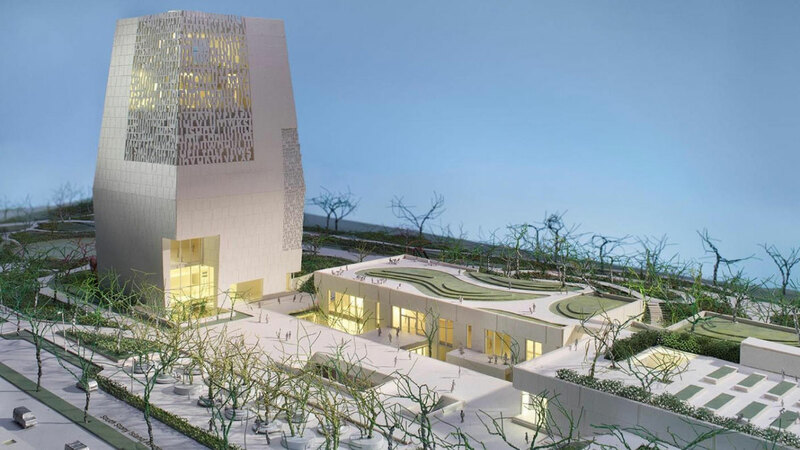 In response to criticism that the building was imposing or inappropriately dense for the site, the architects have replaced sections of the on the south and west sides and replaced them with screens containing quotes from the Obama presidency. 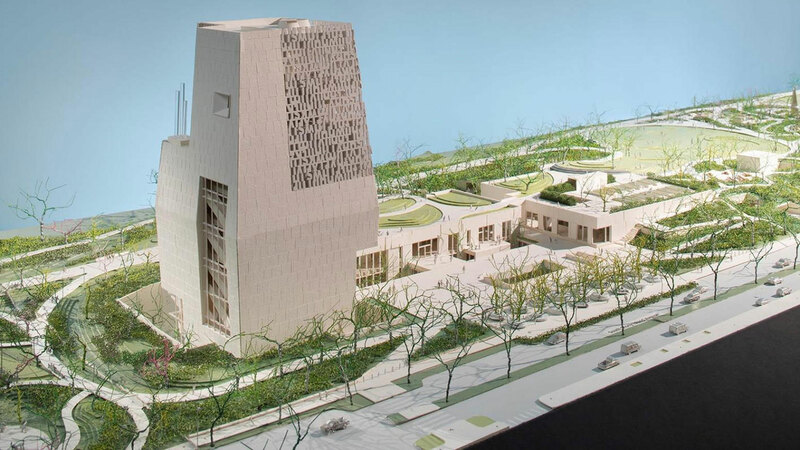 The lettering will be made of the same lightly colored stone as the façade, although architect Tod Williams has told the Chicago Tribune that they aren’t sure whether the lettering will spell out real words, or remain abstract. A 100-foot tall section on the building’s north side has also been replaced with glass and will expose the escalator bank to natural light. 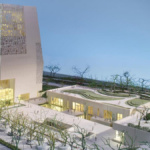 Other details revealed include the creation of a 300-seat auditorium on the forum building’s north side, as well as the ongoing negotiations between the Chicago Public Library over including a branch inside of the library building. The underground parking garage will hold 450 cars across one or two levels, and be punctured with light wells to keep it airy and open. 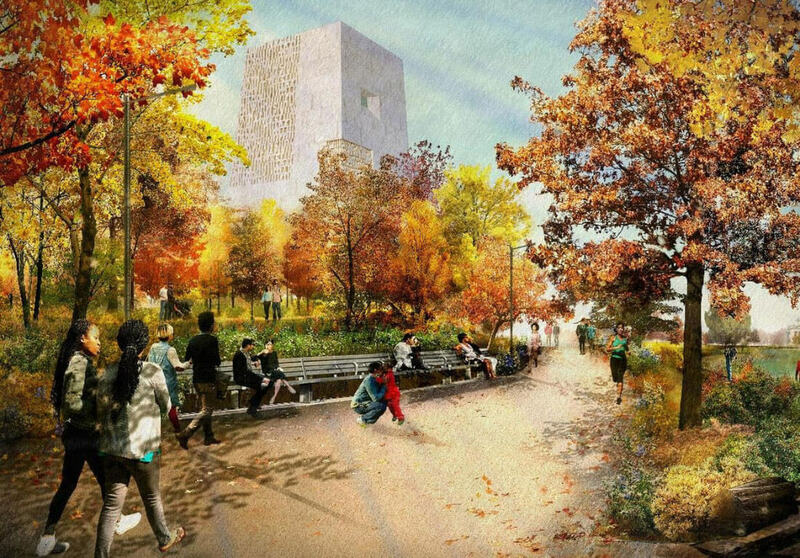 All of these changes come as the Obama Foundation is expected to file for their first construction permit today, and as the project undergoes a federal review to make sure that the Presidential Center won’t fundamentally alter the character of Jackson Park. With the move of the parking garage into Jackson Park itself, the structure will also fall under this review. While the battle over the parking garage has simmered down, preservationists are still concerned over the complex’s impact on a historically significant landscape. 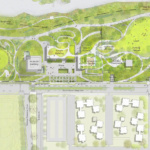 Martin Nesbitt, Obama Foundation chairman, said, “While the center’s buildings will occupy 3.6 acres, there will be a net gain in open space because closing Cornell Drive would create 5.16 acres of parkland,” in addition to the planted green roofs. “That’s not true. 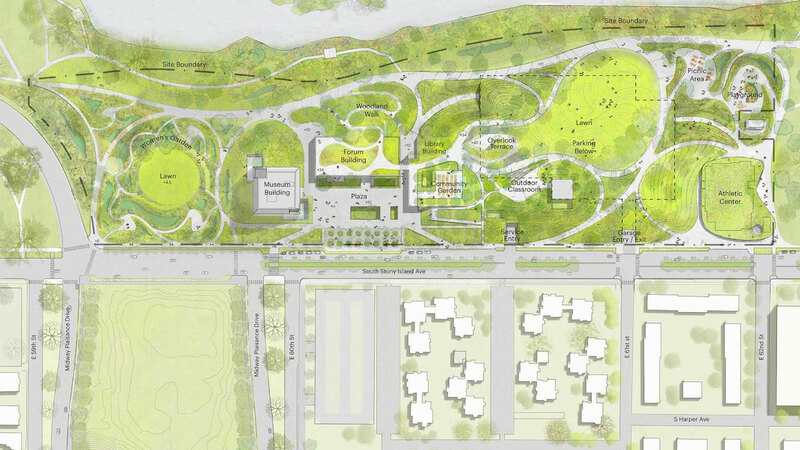 Closing Cornell Drive does not add 5.6 acres of parkland – that’s double counting. Cornell Drive, which unfortunately has been widened to six lanes, is part of the Olmsted design and is itself mapped parkland.